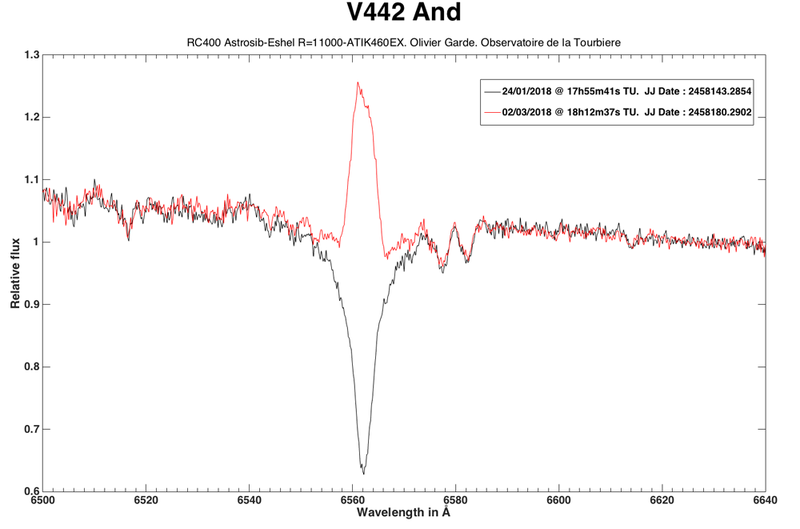 Many of you will remember that Olivier Thizy found V442 And (HD 6226) in outburst last summer. The intense spectroscopic time-series along with some other measurements made at the time prompted myself and some colleagues to propose for Hubble Space Telescope ultraviolet spectra, which are scheduled for sometime between now and March 17. As we were aiming to get the fundamental parameters of the star well constrained with Hubble, we obtained a complimentary optical spectrum with the echelle spectrograph at Apache Point last night. The disk is back and strong, and I am asking for the ARAS group to monitor the star again over the coming weeks, both to have contemporaneous data with Hubble and to monitor another outburst. I've attached images of H-alpha and H-beta taken last night at APO. I'll be using our telescope in Toledo, along with some other colleagues in North America, but this time of year usually gets pretty bad for monitoring here. Noel Richardson, University of Toledo"
motivated by your thread yesterday I started in the evening my first run on this object. Seeing was not so good here in Berlin, but I got somthing like a spectrum. SN is just around 70 after 4 x 1200s. So fara good training to push the limits. I will proceed. Good result !!! Did you put your spectrum in Bess database ? It could be useful to have your spectrum (because there are not many realized on this period). order 34 with H alpha is now in the database. I will prepare the other orders in the next days. Yes I have seen that you have upload your spectrum in Bess. for me V442 And is out of visibility here in Berlin now. The season can start again in July, on higher Azimut with better SN hopefully. Attached the yield for March which is already uploaded to the data base.